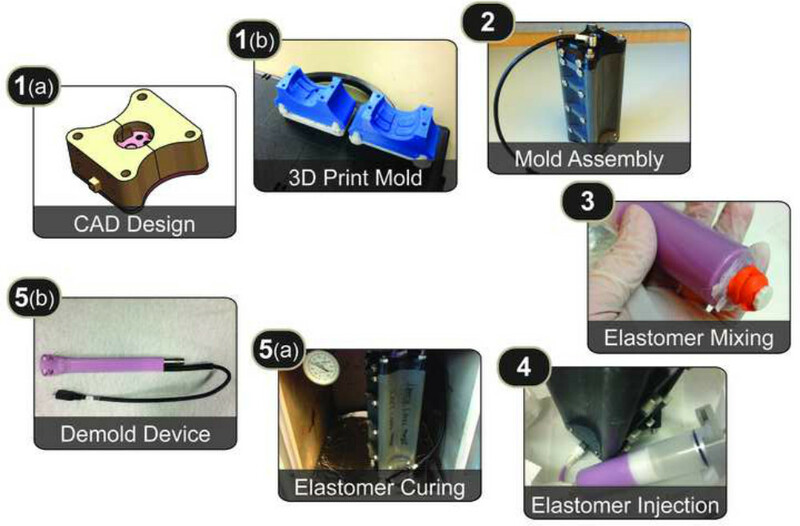 We have devised a method for low-cost and rapid prototyping of liquid elastomer rubber injection molded devices by using fused deposition modeling 3D printers for mold design and a modified desiccator as a liquid injection system. Chung, P., Heller, J. A., Etemadi, M., Ottoson, P. E., Liu, J. A., Rand, L., Roy, S. Rapid and Low-cost Prototyping of Medical Devices Using 3D Printed Molds for Liquid Injection Molding. J. Vis. Exp. (88), e51745, doi:10.3791/51745 (2014). Biologically inert elastomers such as silicone are favorable materials for medical device fabrication, but forming and curing these elastomers using traditional liquid injection molding processes can be an expensive process due to tooling and equipment costs. As a result, it has traditionally been impractical to use liquid injection molding for low-cost, rapid prototyping applications. 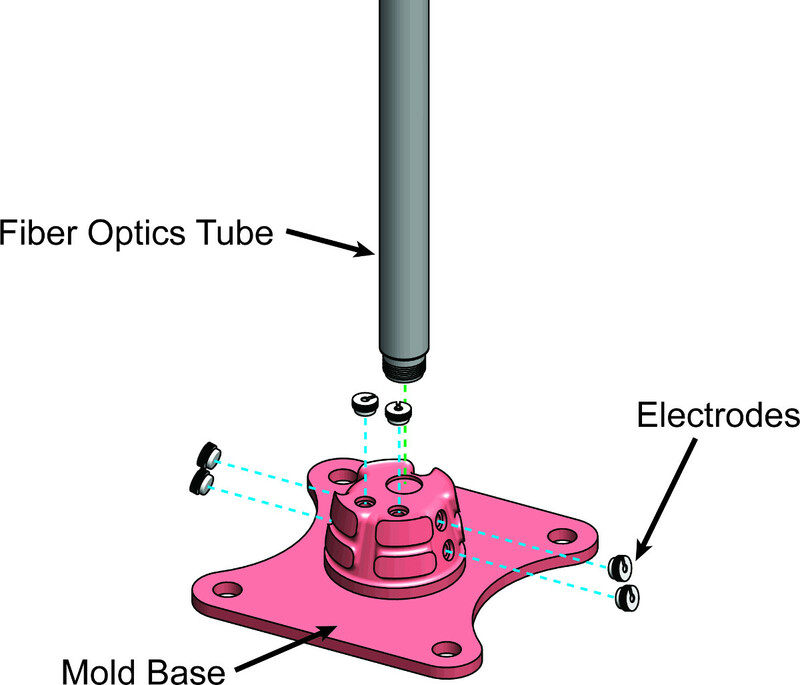 We have devised a method for rapid and low-cost production of liquid elastomer injection molded devices that utilizes fused deposition modeling 3D printers for mold design and a modified desiccator as an injection system. Low costs and rapid turnaround time in this technique lower the barrier to iteratively designing and prototyping complex elastomer devices. Furthermore, CAD models developed in this process can be later adapted for metal mold tooling design, enabling an easy transition to a traditional injection molding process. We have used this technique to manufacture intravaginal probes involving complex geometries, as well as overmolding over metal parts, using tools commonly available within an academic research laboratory. However, this technique can be easily adapted to create liquid injection molded devices for many other applications. Liquid injection molding (LIM) (also known as reaction injection molding) is often used to manufacture elastomeric devices from thermosetting elastomers, but high tooling and equipment costs require a great deal of up-front capital investment1. Furthermore, LIM can be technically challenging and expensive to implement in cases with complex geometry and requirements for overmolding. As a result, it is typically impractical to use traditional LIM in ultra-low volumes or with early-stage device designs that often incur iterative revisions. The typical procedure for injection molding elastomeric materials involves injecting liquid monomers at pressures around 150 psi into a mold using specialized molding machinery2. Temperatures and pressures are controlled to ensure laminar flow and prevent air being trapped in the mold3. Raw materials are typically two-part cure systems, such as platinum cure silicone, that are kept in separate and temperature controlled chambers prior to injection. Both components of the raw material are pumped into a high-pressure mixing chamber that subsequently feeds into the mold cavity. Curing is achieved by the presence of a catalyst as well as temperatures around 150-200 °C4. Molds are typically machined from steel or aluminum to precise tolerances to create a good seal around parting edges3,5. Unfortunately, this process is generally more suited to larger scale manufacturing given high mold tooling costs as well as the requirement for specialized injection and feedback control systems. For rapid prototyping of polyurethane (PU) parts, it is possible to use stereolithography (SLA) to create a mold master and produce a silicone rubber mold6,7. However, this technique is not suitable for overmolding since it is difficult to achieve precise alignment of overmolded components, as the silicone is, by design, not a rigid structure. Furthermore, production of devices with complex geometries, such as invaginations or hollowed out sections, is difficult or impossible. The requirement for complex or precise mold parting lines and rigid thin elements are more often than not, incompatible with the liquid rubber molding process. The aforementioned production-scale or late-stage prototyping processes are often impractical for early-stage medical device development in which a few devices need to be produced for proof-of-concept and feasibility in human studies, as is often the case in academic laboratory and start-up company environments. The lack of alternatives often means that even early-stage development would incur high costs, requiring many device developers to limit device functionality or put development on hold while additional funds are raised. This contributes to a dramatic slowing of the development process since a large fraction of medical devices require implementation of complex features. It is also difficult to fund the costly development of such devices since proof-of-concept data is often not yet established. We encountered this roadblock in a recent project within this lab, which involved the development of a silicone intravaginal probe with overmolded electrical and optical sensors that required a cup-like tip to conform to specified cervical geometries. The process described in this article documents our attempt to circumvent this vicious cycle and rapidly reach proof-of-concept for LIM medical devices. The technique shown in Figure 1 deconstructs the LIM process into 5 main activities: (1) mold design & production, (2) mold assembly (3) elastomer mixing, (4) elastomer injection, and (5) elastomer curing & demolding. Figure 1. Protocol Overview. Overview of the protocol, which involves: (1a) creating a mold using computer-aided design tools, (1b) 3D printing the mold pieces, (2) assembling the mold pieces using threaded rods and screws, (3) mixing liquid elastomer and loading it in a syringe, (4) injecting the liquid elastomer into the mold using a modified desiccator, (5a) curing the elastomer in a temperature-controlled oven, and (5b) demolding the cured elastomer device from the mold pieces. Mold design involves development of a mold master in computer-aided design (CAD) software, subtraction of the mold master from a solid block and definition of mold parting lines. Mold pieces are created and then assembled using screws, rods, and nuts with overmolded components positioned in the mold cavity. Elastomer mixing involves combining parts A and B of raw material and degassing to remove potential void spaces in the material. Next, elastomer injection involves pressure-driven filling of the mold cavity, followed by elastomer curing in a temperature-controlled oven to ensure chemical crosslinking of the polymer chains. Breaking down the injection molding process into these steps enables us to forego traditional LIM equipment in favor of low cost alternatives. For example, instead of machining a metal mold or casting a silicone rubber mold from a mold master, the molds created from the protocol described in this manuscript were created from acrylonitrile butadiene styrene (ABS) plastic using a fused-deposition modeling (FDM) 3D printer8,9. Compared to building metal molds or SLA molds, FDM is generally a cheaper and faster process. Fairly complex molds can be printed quickly on an in-house 3D printer, or cheaply produced by one of the many contract 3D printing services available. For example, a complex eight-piece 3D printed mold was used to cast the demonstrated intravaginal probe in the representative results section and shown in Figures 14 and 15. All parts for this mold can be printed in approximately 1.5 days on an in-house 3D printer. Turnaround times for simpler molds can be a few hours. The overall length of time necessary to prototype a device using FDM 3D printers to create molds is similar to the time required to cast a mold out of silicone rubber and create a polyurethane prototype. However, using FDM 3D printers to create molds allows for several things that cannot easily be accomplished using a silicone mold: (1) many thermosetting elastomers can be used provided the 3D-printed mold can tolerate the required curing temperatures, (2) complex geometries can be created with the use of many different mold pieces and parting lines, and (3) use of rigid mold pieces allows precise and reproducible alignment of overmolded components within the mold cavity. Instead of using a traditional LIM machine, which combines mixing, injection, and curing, it is possible to use a laboratory mixer to ensure homogenous mixing, a modified desiccator for injection, and a standard temperature-controlled oven for curing. The injection system was created using off-the-shelf components and involves the addition of a positive pressure supply line into the desiccator that connects to a syringe filled with mixed elastomer. 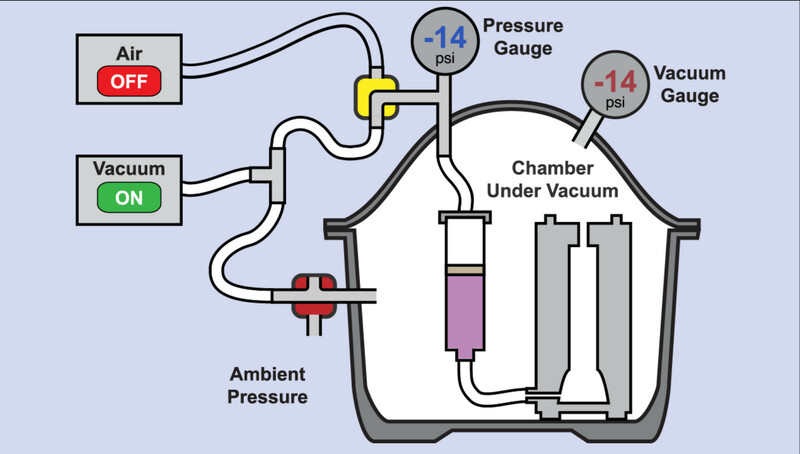 Chamber pressurization in bench top desiccators is typically controlled by a three-way valve between the chambers, a vacuum supply line, and the atmosphere. The modified desiccator adds a positive pressure supply line feeding to the back of a syringe plunger. This enables the creation of a 40-50 psi pressure differential that is sufficient for liquid material injection into the mold cavity. 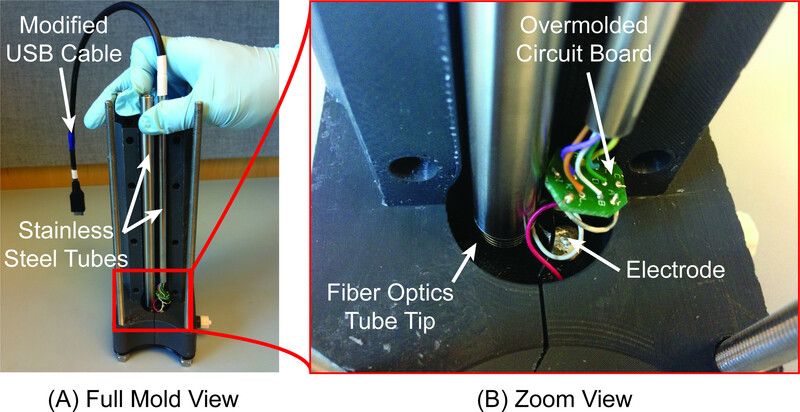 This technique allowed us to produce silicone intravaginal probes with overmolded electrical and optical sensors to collect proof-of-concept data for a Phase I clinical trial. Silicone was selected because of the need for biological inertness as well as the ability to sterilize with a variety of methods10,11. Furthermore, the device required a complex and unconventional cup-like geometry at the tip of the probe where sensors are located to interface with the cervix. Without the use of the described technique, it would have been a much more costly and lengthy process to produce these devices. 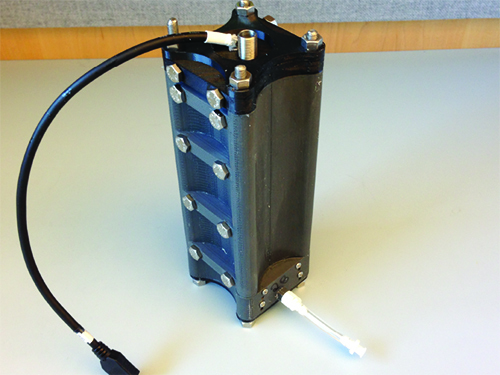 This adaptation of the LIM process reduces cost and equipment requirements when compared to the traditional LIM process, making it practical to adopt a rapid and iterative approach to designing elastomeric devices. This protocol describes the use of specific terminology and features in the SolidWorks software used for Mold Design and Production steps, though other software packages may also be used to accomplish the same result. Design a to-scale mold master using computer-aided design (CAD) software. 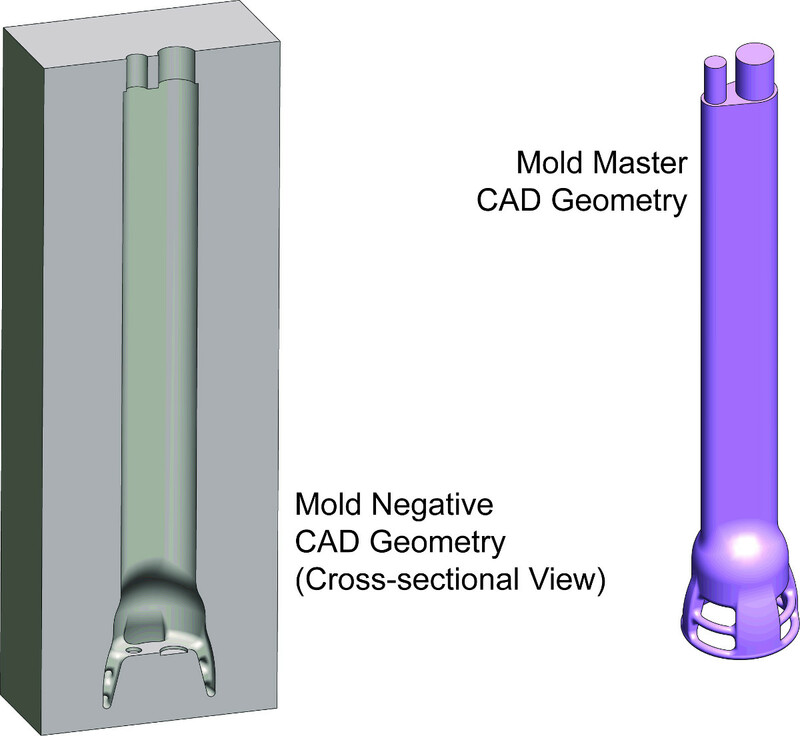 Specific procedures in mold master design will vary depending on the specific geometry of the desired elastomer device. This and subsequent steps will illustrate key steps that result in a specific mold master and mold design that roughly resembles the intravaginal probe device depicted in the representative results section. To define the probe tip, create a 2D sketch in the Right Plane that specifies the internal and external boundaries of a radial cross-section of the cup-like geometry similar to Figure 2A. Use the "Smart Dimension" sketch tool to define sketch dimensions. Ensure all geometries are appropriately constrained by adding sufficient relations between elements of the sketch. When done, exit the sketch. Please refer to Figure 2 in Results. Use the "Revolved Boss/Base" feature to revolve the 2D sketch 360° about the Y-axis to produce a 3D feature that resembles a cup. Individual contours and/or regions of the sketch can be individually selected to selectively revolve desired areas of the sketch with each invocation of the "Revolved Boss/Base" feature. To define the handle of the probe, create a 2D sketch in the Top Plane that specifies the external boundaries of a cross-section of the teardrop-like geometry similar to Figure 2B. When done, exit the sketch. Use the "Extruded Boss/Base" feature to extrude selected contours and/or regions of the 2D sketch in the Y-direction. Extrusions can be extruded in both the positive and negative Y-directions and can also be specified to start/end at specified planes, surfaces, or fixed offsets. Specify the extrusion to begin at the base of the cup-like geometry and extend away from the opening of the cup-like geometry. In a separate CAD file, draw a rectangular prism solid body that is large enough to encase the mold master. To define the rectangular prism, create a rectangle in a 2D sketch in the Top Plane. Ensure the rectangle’s X-dimension is larger than the widest mold master geometry in the X-direction and the rectangle’s Y-dimension is larger than the widest mold master geometry in the Y-direction. When done, exit the sketch. Use the "Extruded Boss/Base" feature to extrude the region enclosed by the rectangle in the 2D sketch in the Y-direction. Ensure the extrusion length is longer than the longest mold master geometry in the Y-direction. Combine the mold master and the rectangular prism to form the mold negative. Please refer to Figure 3 in Results. Import the mold master into the CAD file with the rectangular prism. Align the mold master such that it is centered and completely encased within the rectangular prism. Use the "Combine" feature and select the "Subtract" operation type to create the mold cavity (Figure 3). If using with a low-resolution 3D printer (most FDM 3D printers), note that most small features may not be printed as they are under the machine’s minimum feature size. Thus, pointed corners and edges should be rounded using either "Fillet" or "Chamfer" since these features are too fine for the printer to resolve. Note: If overmolding is desired, parts of the mold cavity must be designed such that the overmolded component can be positioned and constrained within the mold cavity. This can be accomplished by defining portions of the mold to provide alignment guides to the overmolded component (Figure 4). Please refer to Figure 4 in Results. Define parting lines, which will cut the mold into several pieces, and through-holes for threaded rods and screws to hold the mold pieces together (Figures 5 and 6). Specific placement of parting lines and rod through-holes are dependent on the relative placement of one another within the mold cavity geometry. Please refer to Figure 5 in Results. Please refer to Figure 6 in Results. Parting lines are typically chosen in a way that generates bilateral or radial symmetries. They should be defined to avoid overhanging one another in the direction the mold opens, ensuring that a fully cured elastomer device within the cavity can be removed from the mold. Create a bilateral parting line by defining a rectangular 2D Sketch in the Right Plane that extends from the base of the cup-like geometry to the top of the handle of the probe. The rectangle’s width should exceed the end-to-end width of the mold. Use the "Extruded Cut" feature on the sketch and specify a cut toward the negative X-direction to yield one part. Specify a cut toward the positive X-direction to yield the other part formed by the bilateral parting line. Temporarily "Suppress" the "Extruded Cut" feature that was just created. Features can be suppressed or unsuppressed to hide or reveal their effects to the working CAD geometry. Selective toggling of a combination of "Extruded Cut" or "Revolved Cut" features will later be used to isolate each individual part of the mold. Create a radially symmetric parting line to isolate the mold pieces in the cup-like portion of the mold cavity by defining a 2D Sketch in the Right Plane. One side of the sketch should follow the Y-axis while the other edges of the sketch should extend past the mold edges in the radially symmetric portion of the mold. This sketch must also have lines or curves that cut through the internal regions in the radial cross-section of the cup-like geometry, defining two or more regions in the radial cross-section as shown in Figure 2C. Use a "Revolved Cut" feature on the sketch, selecting specific regions defined by the sketch to remove parts of the mold that are not desired in the isolated part. Unselected regions of the sketch will remain, yielding the desired part, after the revolved cut is completed. Note: If overmolding is desired, parting lines should also ensure that the overmolded component can be positioned easily in the mold pre-injection and also removed from the mold post-curing. Define through-holes for the mold by either using the "Hole Wizard" feature or by defining circular 2D sketches in planes normal to the surface and then applying the "Extruded Cut" feature to those sketches (Figures 5 and 6). Create through-holes using a standard clearance hole size, which corresponds to standard threaded rod or screw size being used. Define a gate in the mold by either using the "Hole Wizard" feature or by defining 2D sketches in planes normal to the surface and then applying the "Extruded Cut" feature to those sketches (Figures 5 and 6). The gate provides an entry point for the elastomer to be injected in the mold cavity and should typically be located toward the bottom of the mold cavity. Define one or more vents in the mold by either using the "Hole Wizard" feature or by defining 2D sketches in planes normal to the surface and then applying the "Extruded Cut" feature to those sketches (Figures 5 and 6). Vents allow excess elastomer to drain from the mold cavity once it is entirely full to prevent pressure build-up. Typically the best place for vent placement is near the top of the mold in an area that leads to an empty reservoir to allow overflow elastomer to pool. Ensure that the wall thickness everywhere in the mold is at least 1-1.5 cm if ABS plastic is being used for molds. Walls should be rigid enough that they won’t substantially deform or collapse when mold pieces are under compressive stresses from screws and threaded rods. Note: Excess wall thickness or non-load bearing walls can be removed if desired to speed up the 3D printing of the mold pieces. Additionally, thinner walls and the addition of hollowed out sections will reduce the total amount of material used and the associated cost of that material. Be aware that some FDM printers will do this by default and could prove to weaken walls more than desired. For each mold piece that is desired, suppress or unsuppress the respective "Extruded Cut" or "Revolved Cut" features to isolate that individual part of the mold. Save each mold piece as a .STL file or file-type compatible with the 3D printer being used. Ensure the desired mesh resolution is selected. Load the .STL files into the 3D printer. Print the mold pieces and wait until the job is completed. Remove any support material on the mold pieces after they have finished printing. Note: 3D printers vary in their print resolution with FDM-printed parts generally having worse resolution than SLA-printed parts. Surface roughness can be reduced after a part has been 3D printed either by sanding or by light chemical dissolution treatment as described in the discussion section. Bring mold pieces together to form the mold cavity while aligning the through-holes. Slide threaded rods or screws into the through-holes. Optional: If overmolding, position the components to be overmolded in the mold cavity while assembling the mold pieces (Figure 7). If there is concern of overmolded components moving within the cavity during elastomer injection, a small amount of silicone RTV adhesive can be used to temporarily and weakly secure the component on the inside of the mold cavity. Wait 15 min for the silicone RTV adhesive to cure. Please refer to Figure 7 in Results. Provide firm compression on the mold by using nuts on each end of the threaded rods. A second nut on each end will ensure the nuts are locked into place and do not prematurely loosen. If using plastic molds ensure that nuts are firmly in place, but not over-tightened, to prevent mold deformation. Optional: Seal gaps with silicone RTV and wait 15 min to cure. This is only necessary if lower-resolution molds such as those produced via FDM are used. Limited resolution and poor tolerances at the mold parting lines may create unwanted gaps. Alternatively, surface smoothing as explained in the discussion section can be used to improve fitting of parting lines. Optional: Apply mold release to the mold cavity to make demolding easier. However, this will coat the final device with mold release chemicals. Create a runner or sprue to lead into the mold gate. Insert a barb-to-male luer-lock adapter into the gate of the mold cavity. Ensure a tight fit. Connect this to tubing with barb-to-female luer-lock adapters on each end. The exposed female luer-lock adapter on the distal end of the tube will eventually adapt to a 50 ml syringe with male luer-lock tip. The injection chamber is a modified off-the-shelf desiccator and should be created prior to elastomer mixing since the working time of two-part elastomers after mixing is limited. 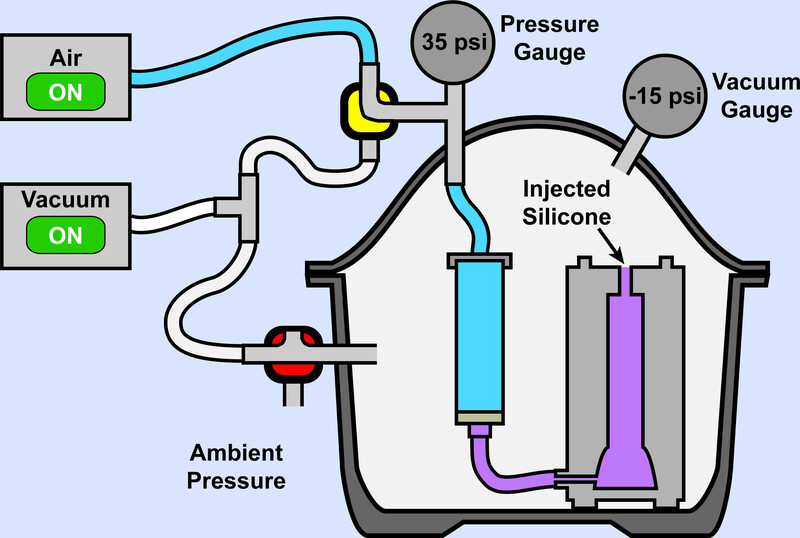 Figure 8 depicts the use of the injection chamber in the injection process. Please refer to Figure 8 in Results. Drill two holes in the top cover of the desiccator lid chamber wall. In both holes install a vacuum rated through-wall pipe fitting that crosses the desiccant lid wall and creates a seal. Note: Use PTFE tape or any other type of pipe sealant on components with pipe fitting connections to ensure air-tight seals. Use tube clamps on any barbed tube adapters/fittings to reinforce air-tightness and prevent tubes from slipping. Install a vacuum pressure gauge on the outside of the lid for monitoring chamber pressure. This is achieved by connecting the vacuum gauge to one of the through-wall pipe fittings with vacuum rated pipe and tube fittings. Install an air-operated syringe adapter on the internal side of the lid at the other through-wall pipe fitting. This is achieved by connecting the syringe adapter to the through-wall pipe fitting with vacuum rated pipe and tube fittings. On the external side of the same through-wall pipe fitting that has the attached air-operated syringe adapter, connect a vacuum rated tee pipe fitting. On one branch of the tee pipe fitting, connect a compound vacuum/pressure gauge for monitoring inject line pressure. On the other branch, connect a vacuum rated three-way L-valve. Connect one branch of the three-way L-valve to a length of tubing leading to a positive air pressure source using pipe and tube fittings. Leave the other branch of the three-way L-valve unconnected for the moment. Most desiccators have a built-in three-way T-valve on the chamber wall. Add tubing connecting one branch of this valve to a tee tube fitting. The other branch of the valve will remain unconnected and exposed to atmosphere for purposes of venting chamber pressure. Connect one branch of the tee tube fitting to a length of tubing connected to a vacuum source. Connect the other branch of the tee tube fitting to the open three way L-valve branch from step 3.1.5 using a length of tubing and vacuum rated pipe and tube fittings. Determine the approximate volume of elastomer desired by examining the volume of the mold master CAD file. Increase the volume by 5% to account for elastomer loss when transferring between containers in the upcoming steps. Calculate the amount of Part A and Part B of the elastomer necessary based on the manufacturer’s suggested mixing ratio. Place a disposable plastic cup on a weigh scale and tare it. Pour Part A and Part B of the elastomer in the disposable plastic cup. Any coloring agents or additives should also be added at this step. Seal the cup opening by pulling a plastic bag over it and sealing with 3-4 rubber bands. Mix for 2 min with a centrifugal mixer to ensure homogenous mixing. If a degas setting is available, mix an additional 1-2 min on the degas setting. If a centrifugal mixer is not available, hand mixing can be used, but may introduce more air into the mixture. Prepare the elastomer injection syringe by using a female luer-lock cap to seal the bottom of a 50 ml syringe with male luer-lock tip. Secure the seal with Parafilm and 1 rubber band. Transfer the elastomer from the plastic cup into the 50 ml luer-lock syringe. If elastomer is clinging onto the walls of the plastic cup, use broad strokes to sweep residual elastomer that is clinging onto the walls of the plastic cup. Avoid many small strokes so as to reduce introduction of air into the mixture. Optional: Degas the elastomer after transferring into the syringe in the centrifugal mixer. This can help accelerate the degassing process described in step 3.8. Seal the open backside of the 50 ml luer-lock syringe by with Parafilm and a rubber band. Mix with the degas setting for 30 sec to accelerate the degassing process. Note: Centrifugal mixers may not have an adapter suitable for holding 50 ml syringes. This step may require design of a custom adapter for the centrifugal mixer, which can be done in CAD and 3D printed. Once finished, remove the Parafilm and rubber band on the backside of the syringe. Place the syringe with backside open in a desiccator and degas for approximately 30 min or until bubbles in the elastomer are eliminated. Take care to consider the working time of the elastomer being used; lower viscosity elastomers will also degas more quickly. Then remove the syringe from the desiccator. Place syringe plunger in the backside of the syringe while removing trapped air. Place a syringe needle sharp side down along the wall of the syringe without touching the elastomer inside it. Place the syringe plunger into the syringe from backside, allowing the syringe needle to release air trapped in between the syringe plunger and the elastomer (Figure 10A). Advance the syringe needle and syringe plunger as necessary until there is no visible air column between the syringe plunger and elastomer. It is acceptable if small amounts of elastomer sneak past the sealing edge of the plunger. Remove the female luer-lock cap on the syringe containing elastomer ready for injection and connect the male luer-lock syringe tip to the exposed female luer-lock adapter on the assembled mold (Figure 10B). Secure the air-operated syringe adapter onto the backside of the 50 ml syringe with male luer-lock tip. Place both the mold and the attached syringe into the injection chamber. At this point, the injection chamber should look similar to Figure 11. Please refer to Figure 11 in Results. Place the cover onto the injection chamber, ensuring that an airtight seal is formed. Pull the entire system within the injection chamber to a vacuum. Please refer to Figure 12 in Results. Turn both three-way valves on the injection chamber so that the vacuum source is continuous with the desiccator chamber and the column of air behind the syringe plunger. Slowly pull a vacuum until approximately -14.5 psi is achieved (Figure 12). Leave the vacuum on to maintain this pressure. Removal of air will prevent bubbles from accumulating in the mold cavity and help reduce void spaces within the elastomer device. Push positive pressure at the backside of the syringe plunger. Please refer to Figure 13 in Results. Turn the three-way L-valve to break continuity between the vacuum source while establishing a connection between the positive pressure air supply and the backside of the syringe plunger. 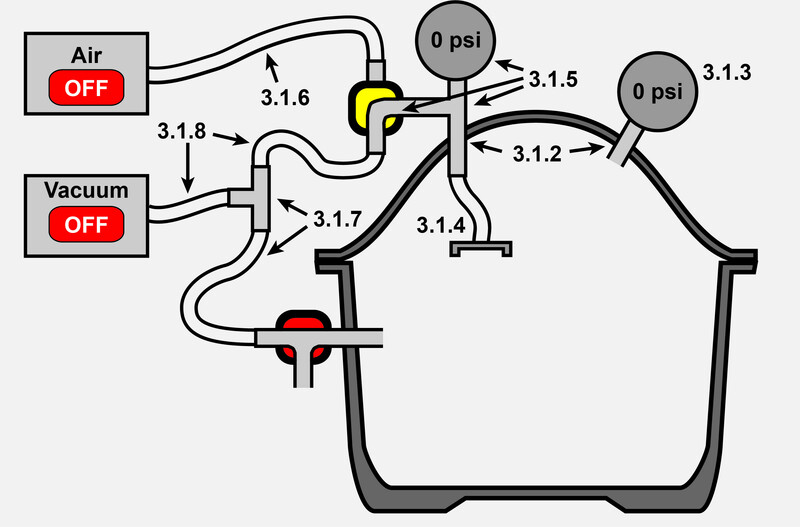 Gradually ramp up positive pressure from the air supply until at least 25-35 psi is achieved (Figure 13). Higher pressures are possible depending on the strength of tubing connections used on the injection chamber apparatus. Wait until the syringe plunger has reached the bottom of the syringe or until elastomer flows out of the mold vents. These indicate injection is complete. Return the injection chamber back to atmospheric pressure. Turn off both vacuum and positive air pressure supplies. Gradually turn the three-way L-valve connected to the air-operated syringe adapter back so it is closed to air supply and open to the vacuum source. This should vent all positive pressure. Turn the three-way T-valve to vent residual pressure in the chamber to atmospheric pressure. Remove the mold and prepare for elastomer curing. Open the chamber and remove the mold. Detach the air-operated syringe adapter from the back of the syringe. Detach the syringe as well as the tube with two barb-to-female luer-lock adapters. Place a female luer-lock cap on the exposed male end of the barb-to-male luer-lock adapter that is attached to the mold gate to prevent elastomer from flowing out of the mold cavity. Place the mold in a temperature-controlled oven and cure the elastomer. Consult elastomer manufacturer specifications to determine the cure time and temperature. The silicone mixture for the intravaginal probe being demonstrated is cured at 70 °C for 5 hr. Once elastomer is cured, remove the mold from the oven. Demold the fully cured elastomer device. Remove nuts and threaded rods or screws from the mold. Optional: If silicone RTV adhesive was used to seal gaps at the parting edges, use a scalpel to gently cut into the silicone RTV adhesive so the parting edges can be separated. Use a scalpel to cut away and separate the device from extra elastomer material at the gate or vents. Use a scalpel to cut away any flash that may have formed at the mold parting edges. Clean the molds with a wipes and non-destructive solvents such as isopropyl alcohol. Figure 2. 2D CAD Sketches. A) 2D Sketch that can be radially revolved about the Y-axis to produce a cup-like feature similar to the one on the intravaginal probe device. B) Teardrop-shaped 2D sketch that can be extruded out of the plane into a prism-like structure that forms the handle of the intravaginal probe device. 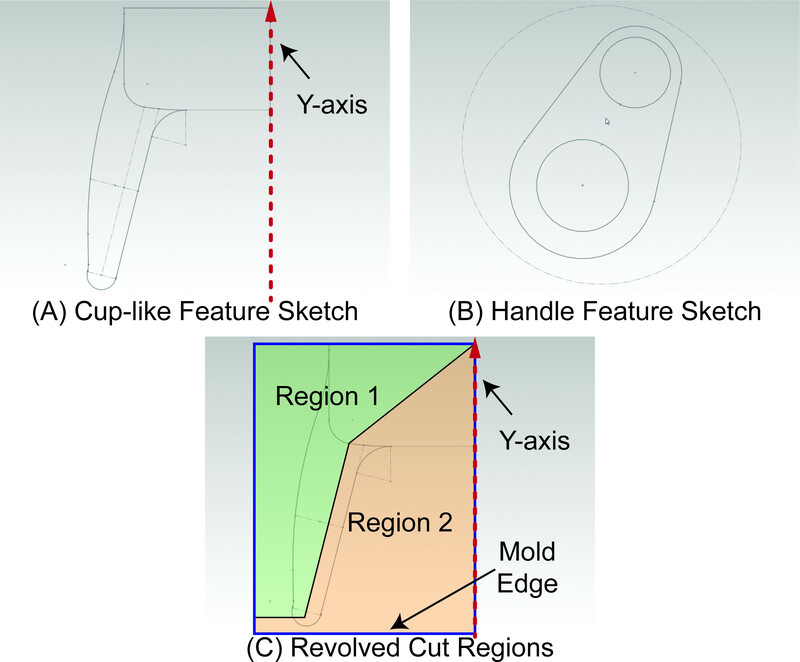 C) An example sketch that creates two regions in the radial cross section of the cup-like feature region of the mold. Revolved cuts selectively in Region 1 or Region 2 around the Y-axis will yield different mold pieces. Figure 3. Creating the Mold in CAD. CAD drawings of the mold master (right) and mold negative (left) for an intravaginal probe device is depicted. The mold negative is created by subtracting the mold master geometry from a rectangular prism and will eventually be partitioned into two or more pieces and become a functional mold. Figure 4. Designing Alignment Guides in the Mold. Exploded CAD drawing of the mold base, fiber optics tube, and electrode components. The fiber optics tube and electrodes must be precisely positioned and overmolded to produce an intravaginal probe. Alignment guides are designed into the mold base to allow these components to stay in place while liquid elastomer is being injected into the mold cavity. Figure 5. Mold: Exploded View. Exploded CAD drawing of the finished mold assembly for the intravaginal probe device. The geometry of the mold cavity not only specifies the external geometries of the final intravaginal probe device, but also provides anchoring and positioning points for components to be overmolded. Specifically, the mold base geometry and the upper left and upper right pieces align the fiber optics tube, and the mold base provides insets for aligning the electrodes on the final device. Figure 6. Mold: Assembled View. CAD drawing of the finished mold assembly for the intravaginal probe device. Liquid elastomer will be injected into the gate and fill the mold cavity before flowing into the overflow reservoir at the top. Vents running from the mold cavity to the overflow reservoir are carefully designed into the alignment pieces of the mold at the top. Figure 7. 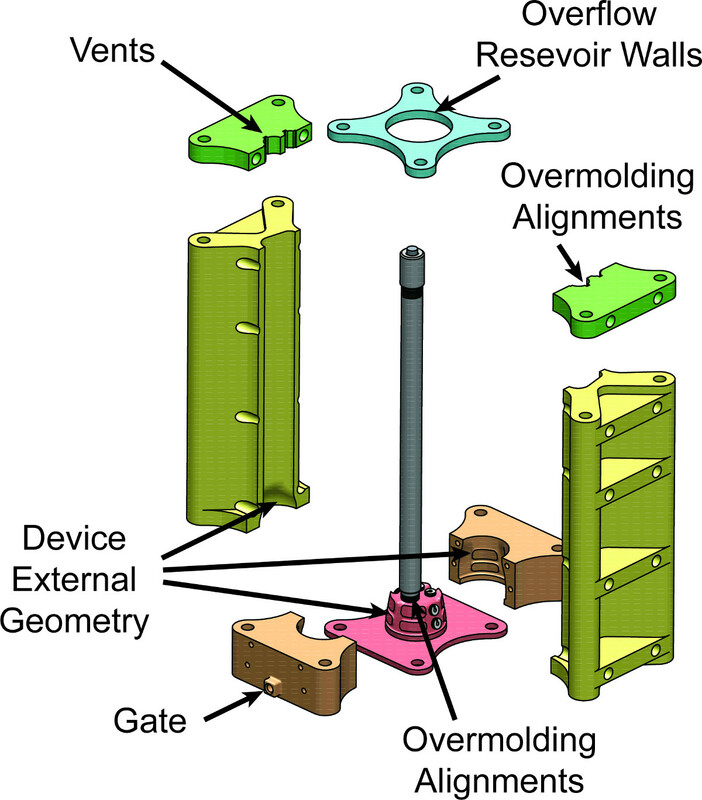 Alignment of Overmolded Components. 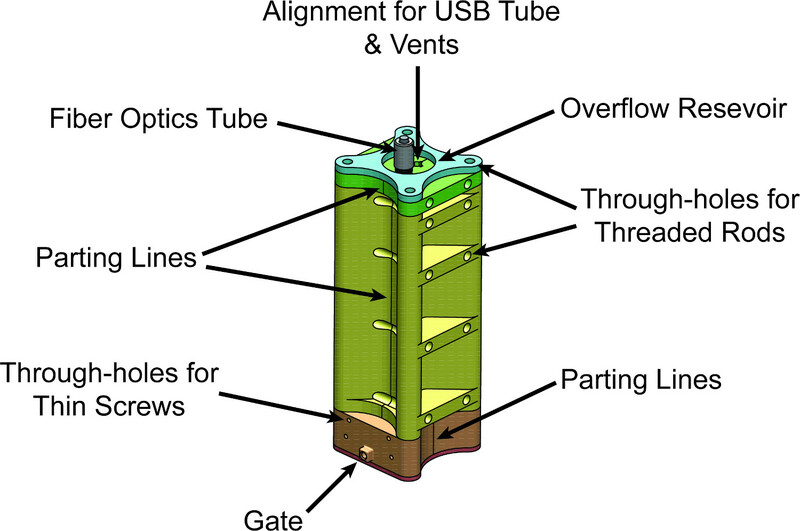 A) Partially assembled mold depicting the alignment of two stainless steel tubes, a small printed circuit board, and six electrodes in the mold cavity. Positioning mold pieces at the top of the mold along with invaginations in the mold base physically constrain movement of all components during elastomer injection. B) Zoom view of the bottom of aligning components near the mold base. Figure 8. Elastomer Injection Process. Animation that first depicts modifications to a standard laboratory desiccator to create the injection chamber, and then depicts the manipulation of pressures to inject liquid elastomer from a syringe into a mold. Please click here to view this video. Figure 9 is a schematic that describes how to modify the desiccator to create the completed injection chamber. Figure 9. Creating the Injection Chamber. Injection Chamber after desiccator modification is completed. Corresponding steps in the procedure are labeled in the figure. See Figure 10C & 10D for the injection chamber used to fabricate the intravaginal probe. Figure 10. Elastomer Mixing and Injection. A) After the liquid elastomer is mixed and degassed, a syringe plunger is inserted into the syringe. Air between the plunger and the elastomer is removed with the aid of a syringe needle as the plunger is inserted. B) The syringe with elastomer is attached to the mold at the gate via luer-lock couplings. C) The injection chamber is a modified desiccator that can generate at least 40-50 psi of pressure across the syringe plunger with the aid of a vacuum and positive air pressure supply. D) Mold after injection of elastomer using the injection chamber. Figure 11. Elastomer Injection: Beginning. 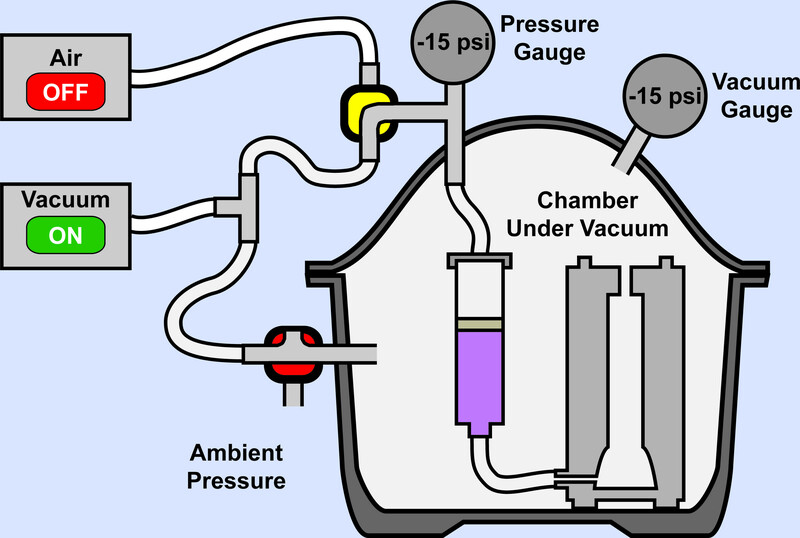 Injection chamber depicted at the start of the liquid rubber elastomer injection process. Both sides of the syringe plunger are exposed to ambient pressure. Figure 12. Elastomer Injection: Middle. Closing of 3-way valve near the bottom of the setup seals injection chamber and allows both sides of the syringe plunger to be pulled to a negative pressure. Figure 13. Elastomer Injection: End. 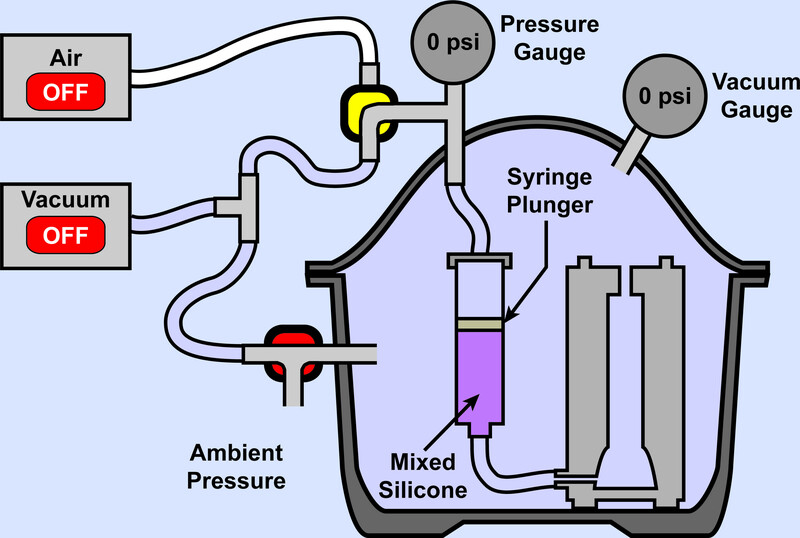 Turning of the 2-way valve at the top of the setup allows application of positive air pressure behind the syringe plunger, generating at least 40-50 psi. The mold and intravaginal probe in Figures 14 and 15 demonstrates representative results of the procedure presented in this article. Figure 14. Fully Assembled Mold. Fully assembled mold for intravaginal probe device. Figure 15. Intravaginal Probe Device. Final intravaginal probe device. A) Front view of the cup-like tip of the device. B) Side view of the same device. The cup-like structure consists of six overmolded titanium electrodes as well as a stainless steel tube that acts as a female receptacle for a fiber optic probe. Specific use of this device is described in Etemadi et al12,13. The mold used to create the intravaginal probe was fabricated from ABS430 material using a Dimension uPrint Plus 3D printer. One mold for the intravaginal probe required approximately 1 reel of ABS430 material priced at $140 per reel. It took approximately 1.5 days to print all eight pieces of the mold. A medical grade two-part platinum cure silicone designed for LIM applications (PN40029) was used in this application. Overmolded in the bulk silicone are custom stainless steel tubes, a modified USB cable, several wires, and titanium electrodes, which were kept in place during silicone injection via carefully designed alignment and positioning geometries in the mold. One of the tubes is exposed at the base of the cup-like structure on the intravaginal probe and has a glass window on the end of the tube to act as a female receptacle for a fiber optic bundle used for optical measurements. This is the sole external feature that was added after the silicone was cured and demolded using the documented process. Specific results may vary depending on the desired geometry and whether or not overmolding is required. The intravaginal probe demonstrates that creation of complex geometries such as a thin cup-like structure is possible with FDM 3D printers, though simpler geometries would likely require fewer mold pieces, less mold material, and would be faster to 3D print. Use of higher resolution 3D printing technology such as SLA may be able to provide higher resolution, finer geometries, and superior surface finishes which may eliminate the need to manually finish molds. Using the technique described, overmolding of many different components may be accomplished as long as mold design is implemented carefully. Of all the steps described, careful mold design is the most critical to success. The mold master should be created as a solid body with external geometries equal to the final device. These geometries should be adjusted to account for any material shrinkage due to the chosen elastomer as well as 3D printer resolution and tolerances. Placement of mold parting lines and through-holes for threaded rods and screws are dependent on one another. Adding parting lines increases the number of linear and rotational degrees of freedom of the mold assembly. Through-holes and threaded rods and screws act to constrain these same degrees of freedom. The mold must be designed such that it constrains all linear and rotational degrees of freedom when fully assembled, while enabling the removal of a fully cured elastomer device when the constraining threaded rods and screws are removed. If the cured elastomer is reasonably elastically deformable, parting lines can be defined such that features overhang one another slightly since the fully cured device can be pushed or pulled out of mold pieces. If overmolded components are desired, the mold design must also provide positioning features to constrain movement of overmolded components in a fully assembled mold. Mold parting lines should be carefully chosen to minimize the number of mold pieces that are necessary to produce the desired elastomer device. Minimizing the number of mold pieces and parting lines decreases the potential for flash formation and decreases the number of through-holes necessary for compressing the mold pieces during mold assembly. From our experience, an ABS mold lasts around 20 uses before the ABS plastic wears out, cracks, or crazes due to compressional stresses and heating cycles. Once mold pieces have been printed using FDM 3D printers, several modifications can be made to the mold pieces. In some cases, mold pieces made from FDM 3D printers may have insufficient resolution to produce perfectly flush surfaces at the parting lines, resulting in a small gap that can lead to flash formation as well as leakage of liquid elastomer. If this occurs, use of a thin layer of RTV silicone at the parting lines of an assembled mold can prevent leakage of liquid elastomer through the mold parting lines. Alternatively, surface smoothing can be accomplished either by adding extra material to mold pieces (oversizing them) and sanding to final dimensions or by treating the ABS with acetone, which gradually dissolves the plastic. These methods can be carefully used to fine-tune mold geometries at the parting edges to reduce flash formation. However, one must be careful when dissolving mold surfaces, since doing so will chemically reduce the strength of plastic, making it easier for cracking and crazing. This can reduce the lifetime of the mold and also affect consistency of surface geometries between molds. Furthermore, it is difficult to control the uniformity of mold dissolution, which may cause slight variations in mold geometry. This may become an issue if multiple sets of molds are used to fabricate devices. To work around this problem, higher resolution 3D printing techniques can be used for mold production. Another benefit of utilizing a higher-resolution mold or acetone-treated mold is the added ease of separating the elastomer device from the ABS molder during demolding. Alternatively, mold releases can be used to coat the mold cavity to assist demolding. However, for the intravaginal probe demonstrated in this procedure, mold release was specifically avoided due to the potential risk of introducing mold release chemicals into the vaginal environment. Care should also be taken to ensure that selected mold material does not inhibit curing of the elastomer. One challenge in overmolding components in silicone elastomer, such as the one used for the intravaginal probe, is that adhering silicone and metal is notoriously difficult. One requirement for the intravaginal probe was to allow small gaps at the material interfaces to occur if the silicone is elastically deformed. This reflects the desire to allow the cup-like structure on the intravaginal probe to flex and stretch like a sleeve around the cervix while still ensuring water tightness between both metal and silicone parts of the device. Water tightness was necessary due to human experiment guidelines for cleaning and sterilization of the device in hydrogen peroxide plasma. This requirement was met after demolding the devices by carefully applying a medical grade silicone to metal adhesive primer to the junction between the silicone device body and metal components and then applying room temperature cure (RTV) silicone to the metal-elastomer junctions. An additional method employed to improve adhesion between metal and silicone was to design all embedded metal components with circular fins. Upon injection, space between the fins is filled with liquid silicone, which then solidifies during curing. This design feature allows stresses to be transferred from the silicone body to metal components while reducing the tendency for gap formation between metal and silicone. While there are many advantages associated with the use of ABS-based FDM 3D printers—namely rapid print speeds, low cost, and plethora of contract printing services that use the technology—these benefits must be carefully weighed with respect to the trade-offs being made. ABS-based 3D printers enables a rapid prototyping and iterative development approach while ABS itself is suitable for molding many elastomers because it is generally chemically inert14,15. However, ABS plastic has a heat deflection temperature of approximately 90-100 °C, which limits the maximum work temperature at approximately 70 °C16. This means that higher curing temperatures cannot be achieved using ABS molds. As a result, the cure time of the elastomer used for the intravaginal probe was increased from 3 min at 175 °C to 5 hr at 70 °C. If higher cure temperatures are desired, one may consider using other FDM materials such as polycarbonate. Use of SLA-based 3D printing enables the finest mold resolution possible and provides a wide selection of resin materials. However, continued advancement in FDM technology is closing the resolution gap between the two techniques. While the FDM-based molds used in creating the intravaginal probe had a layer resolution of 254 μm, newer FDM machines can achieve 100 μm resolutions and below. SLA-based 3D printing is generally more expensive and more time intensive than FDM-based 3D printing, and much fewer facilities possess in-house SLA equipment. These factors make FDM 3D printers more suitable for low cost rapid iterative development. In fact, SLA is commonly used for prototyping and low-volume runs of polyurethane devices by printing a mold master and casting a silicone mold around the mold master to create the mold for polyurethane injection. The benefit of using silicone as a mold material is that it is a thermosetting polymer and will not melt at higher curing temperatures. However, it is difficult or impossible to partition the silicone mold into many pieces to generate complex molds such as the intravaginal probe device; furthermore, alignments for overmolding may be similarly challenging. The result is that silicone molds produced with this method are generally two-piece molds and require traditional LIM equipment for injection of polymer into the mold cavity. Thus, while this method is not as expensive as traditional LIM injection, the total cost of prototyping using this method is still rather costly and is more time intensive than the described protocol for using FDM 3D printers and a modified desiccator for elastomer injection. Other benefits of the proposed methods include the ability to directly print mold pieces without first creating a physical mold master, as well as the fact that this technique does not require investment in costly SLA or LIM equipment. The proposed method enables rapid prototyping of elastomer devices with complex geometries and requirements, which is a hallmark of fields such as medical devices. The lack of standard or documented methods to rapidly iterate elastomer devices has contributed to slow and costly development of medical devices. The inherent flexibility in the process described in this manuscript allows for almost any geometry to be built and overmolding requirement to be met. It can be used to rapidly and cheaply iterate device prototypes early in the medical device development process. This is especially useful in resource-limited environments such as academic laboratories or start-up environments where 3D printers are increasingly prevalent but LIM equipment is rare. Additionally, CAD models produced in this process are transferable to future manufacturing processes and can be used to facilitate production of traditional metal molds used for LIM. While this technique was demonstrated for medical device development with the intravaginal probe device, the protocol can easily be adapted for other fields and applications in which low-cost, low-volume, and rapid iterative development of elastomer-based devices are desired. None of the authors have any competing financial interests with respect to the work detailed in this article. The authors thank Sungwon Lim for intellectual contributions to device and mold design as well as Jambu Jambulingam and Rebecca Grossman-Kahn for creating intravaginal silicone probes using this process. This work is supported by the Bill and Melinda Gates Foundation, the Vodafone Americas Foundation, and the FDA (2P50FD003793). Painter, P. C., Coleman, M. M. Essentials of Polymer Science and Engineering. DEStech Publications. Lancaster, PA. (2009). Rosato, D. V., Rosato, M. G., Schott, N. R. Reaction Injection Molding. Plastics Technology Handbook - Volume. 2, 103-139 (2010). Cybulski, E. Plastic Conversion Process: A Concise and Applied Guide. CRC Press: Boca. Raton, FL. (2009). Ortiz, H. ernández, J,, Osswald, T. Modeling processing of silicone rubber: Liquid versus hard silicone rubbers. Journal of Applied Polymer Science. 119, 10-1002 (2010). Dym, J. B. Injection Molds and Molding: A Practical Manual. 395, New York, NY. (1987). Mueller, T. Stereolithography-based prototyping: case histories of applications in product development. Northcon 95. IEEE Technical Applications Conference and Workshops Northcon. , 305–310, doi:10.1109/NORTHC.1995.485087. (1995). Hilton, P. Rapid Tooling: Technologies and Industrial Applications., 288, Press: Boca. Raton, Florida. (2000). Ahn, S. -H., Montero, M., Odell, D., Roundy, S., Wright, P. K. Anisotropic material properties of fused deposition modeling ABS. Rapid Prototyping Journal. 8, (4), 248-257 (2002). Cheah, C. M., Tan, L. H., Feng, C., Lee, C. W., Chua, C. K. Rapid investment casting: direct and indirect approaches via fused deposition modelling. The International Journal of Advanced Manufacturing Technology. 23, (1-2), 1-2 (2004). Harris, A., Wild, P., Stopak, D. Silicone Rubber Substrata: A New Wrinkle in the Study of Cell Locomotion. Science. 208, (4440), (1980). Moisan, M., Barbeau, J., Moreau, S., Pelletier, J., Tabrizian, M., Yahia, L. H. Low-temperature sterilization using gas plasmas: a review of the experiments and an analysis of the inactivation mechanisms. International journal of pharmaceutics. (1-2), 226-221 (2001). Etemadi, M., Chung, P., Heller, J., Liu, J., Rand, L., Roy, S. Towards BirthAlert - A Clinical Device Intended for Early Preterm Birth Detection. IEEE Trans Biomed Eng. 10, (2013). Etemadi, M., Chung, P., et al. Novel device to trend impedance and fluorescence of the cervix for preterm birth detection. Conf Proc IEEE Eng Med Biol Soc. 2013, 176–9, doi:10.1109/EMBC.2013.6609466. (2013). Owen, S. R., Harper, J. F. Mechanical, microscopical and fire retardant studies of ABS polymers. Polymer Degradation and Stability. 64, 449-455 (1999). Cassidy, P. E., Mores, M., Kerwick, D. J., Koeck, D. J., Verschoor, K. L., White, D. F. Chemical Resistance of Geosynthetic Materials. Geotextiles and Geomembranes. 11, 61-98 (1992). Akay, M., Ozden, S. The influence of residual stresses on the mechanical and thermal properties of injection moulded ABS copolymer. Journal of Materials Science. 30, (13), (1995). Rapid prototyping has been forcing medicine in many different ways. Perhaps the main application to design and develop medical devices is very crucial. This is just an outgrowth of the engineering technology applications. Its fine example you can watch out at http://3dprintboard.com/showthread.php?6234-French-Doctors-3D-Print-a-Fertilized-Embryo. In any field the decrease of product development time without affecting functional performance of product is definitely an excellent prospect for rapid prototyping.